The Karafet et al (2008) paper made a major change to Haplogroup K. The subgroups formerly known as K1 and K7 was moved to M2 and M3, respectively, and K2 and K5 became Haplogroups T and S, respectively. The 50f2/C deletion in the AZFc region of the human Y chromosome has been observed in several different haplogroups and is not a unique event polymorphism. It is notable, however, that it has been detected at relatively high levels in subgroups of K in Melanesia - K* (21%), and K3 (14%). Identical SNPs that were discovered separately are listed in alphabetical order, not necessarily in the order of discovery, and separated by "/". Examples: M74/N12, M184/USP9Y+3178. Y-DNA haplogroup K is an old lineage established approximately 40,000 thousand years ago whose origins were probably in southwestern Asia. At present this group contains two distinct classes of subgroups: (1) major groups L to T (refer to the main tree at Y-DNA Haplogroup Tree) and (2) minor groups K* and K1 to K4 which do not have any of the SNPs defining the major groups. These groups are found at low frequencies in various parts of Africa, Eurasia, Australia and the South Pacific. Added Karafet et al (2008) on 4 May 2008. First paragraph of Haplogroup description revised 4 May 2008. SNPs to added to Haplogroup K on 4 May 2008: P128, P131, P132, P256, P261, P263. Fixed hyperlinks to S and T on 5 May 2008. Fixed misspelling of subgroups on 5 May 2008. Added P299, P304, P307, P308 on 22 December 2008. 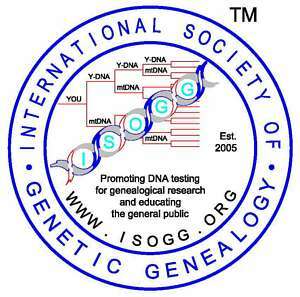 Copyright 2007, 2008, International Society of Genetic Genealogy. All Rights Reserved.